The new Tustin, CA Whole Foods recently opened with a twist. The Tustin store is the first Whole Foods location to include an outpost of Mendocino Farms, the fast-casual organic sandwich chain in which Whole Foods bought a minority stake in 2015. The Whole Foods restaurant is the 15th location for the LA-based mini-chain with plans for growth, and it anchors a food court that also features a bar and Whole Foods branded items. While it’s the first instore restaurant resulting from the Whole Foods-Mendocino Farms partnership, it’s not the first time the organic grocer has invited an outside restaurant to take up space in one of its stores. Food truck impresario Mark Choi opened a Whole Foods location for Chego (Downtown LA, November 2015) and Kogi (El Segundo, November 2016), and the Whole Foods Philly City Center features an instore location from that city’s CheU Noodle Bar as well as branded foodservice concepts from in-town hummus and pasta producers. In addition, the new 365 by Whole Foods concepts (the company’s play at providing produce and groceries at more affordable price) reserve space for a “Friends of 365” partner restaurant. The Lake Oswego, OR Whole Foods is home to three-unit Next Level Burger while Seattle plays host to Wild Ginger Kitchen, an offshoot of local mainstay Wild Ginger. Only the Silver Lake (LA) store breaks the home-team trend by importing vegan by Chloe, a New York City concept making its West Coast debut in Whole Foods. We can expect more of the same in 2017 – because it makes sense. 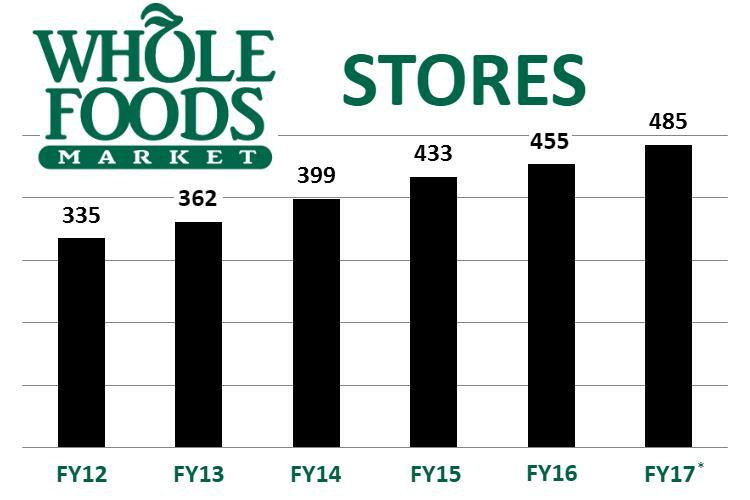 As Whole Foods ages and grows (see the chart below), it loses a bit of its healthy-moneyed-hip-kinda-local cache each year. Bringing in plucky often-local upstarts provides Whole Foods with a fresh coat of “new,” burnishes its reputation as a supporter of all things local and imparts the stores with a “destination” feel. With four 365 stores on tap for 2017, it will be interesting to see whether Mendocino Farms is a component of one or more of those locations, as well as number and mix of other foodservice concepts in both Whole Food and 365 locations going forward. Source: Chain Store Guide’s Database of Supermarket, Grocery & Convenience Store Chains. *CSG projections based on proprietary analysis and company statements. Actual figures are subject to change. This data is not intended for investment decisions.